In education, there are many trends that come and go over the years. One of the trends that never leaves is the power of narrative. It is not narrative in the sense of reading; it is narrative in the sense of making the work that is done in class into a narrative to engage the students’ interest. When a student is given work without having a narrative purpose they will only see the work as a task that needs to be checked off. When the work is given as part of a story in that class, that work takes on new meaning and becomes personal. The narrative provided in the simplest application of this concept relates the work to the student’s future goals and how the work will benefit them. This is weak because it is based on the presupposition that the student knows their goals or their goals align with the teacher’s perception of what a proper goal should be. To truly engage the students in the narrative the teacher must make the students care about the story and they should be able to see themselves in the arc of the story. This level of engagement takes crafting, creativity, and a certain je ne sais quoi with pronouns. Having familiarity with role-playing games is a big step towards being able to engage the students in the narrative. At this point, many readers may be shaking their heads because narrative will not work in their class because of subject matter or class composition. That is an unfounded belief. It is not easy to craft a narrative alone, no DM can do that without years of experience and when they craft ideas they often draw on past experiences and combine ideas. For educators to use narrative they will have to collaborate with others and be able to read their audience. Students can see educational narrative a mile away and they cringe as soon as it is spotted. Teachers must avoid the tropes and look to what the students enjoy in their free time. Look at the stories found in the imaginary worlds that student immerses themselves in; the television shows they watch, the video games they play, books they read, and the movies they watch. Each example has a story that is rich in material that can be made part of any classroom narrative. If you are not familiar with what your learners enjoy you can ask them and then find summaries, primers, and explainers on the internet. Who knows, you may find something you enjoy yourself. There are other ways that role-playing gaming has informed instruction in classrooms. There is a game that teaches coding to students called CodeCombat. 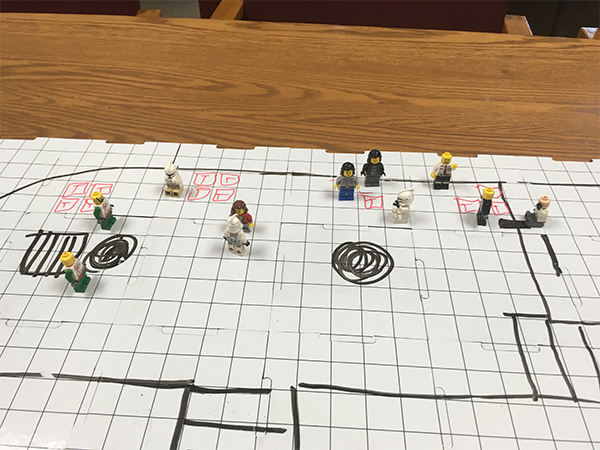 In the game, students learn to use elements of code to guide their adventurer through a dangerous world of dungeons that need to be crawled. There is a classroom management software called Classcraft that gives students traditional class roles and allows them to compete in challenges to improve their character in the game world. The challenges can be as simple as behavior and as complex as differentiating learning objectives to encourage students to excel beyond their usual levels of effort. Beyond the pre-made materials provided by companies that see profit in playing games in class, educators have been turning to their own creativity. In classrooms across the nation, you can find bulletin boards, behavior charts, and classroom themes that all have the flair of world-building and mechanics to them. Educators know that rules are the foundation that trust can be built on and they have a system in place for every activity. Many of these teachers would not consider what they have created to be derivative of a role-playing game and they would not admit that they occasionally cheat when they make decisions behind the proverbial DM screen. They may call their cup full of popsicle sticks with names on them random, but they often read a name that is not listed or stack the cup by adding or removing sticks with kid’s names on them. A few teachers who have a history playing table-top role-playing games will dig the D20 out of their desk and roll it when they need to pick a student at random. They do not do this for the outcome it provides, rather they do it for that moment of connection as a student in their class notices what they just rolled and their eyes widen. That student and teacher have connected at the roll of an icosahedron. The reason that narrative is so powerful in the classroom is the phenomena of adolescent psychology known as Personal Fable. Parents have joked that their children see themselves as the center of the universe since the dawn of time. It turns out they are not wrong. Personal Fable is the belief that one is the sole actor in life and that all other people met are there to interact with you. Each child subconsciously believes that others cease to act when they are gone and that because they are the center of the story they are invulnerable. Personal Fable is not a dig on the young; it is a formal stage of brain development that has been observed since the Greeks and was codified by David Elkind in 1967. Eventually, the adolescent begins to feel empathy for others and expands their view of the world. It is during the time of Personal Fable affecting the perception of students that it is most important that educators reach out with a narrative that will engage the student and guide them to a place where they will embrace learning. The world of gaming has gone through a great expansion over the last ten years and there is a game out there for every taste. There is no better way to build a relationship with others than to go on a table-top adventure with them. There is no better teacher in the art of narrative than having to make on-the-fly decisions to respond to the unimaginable choices players can make. In the end, there is no better way of communicating knowledge, emotions, and learning than to tell a story that makes them keep coming back for more. To teach is to be a storyteller; to inspire is to lead your students on an adventure for life. 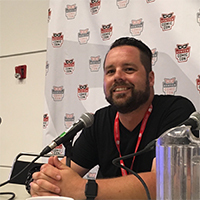 has spoken at Denver Comic Con, American Library Association, Chicago Comic and Entertainment Expo, and New York Comic Con. serving as the Vice Chair of the National Education Association’s Science Caucus since 2017.
children who have been orphaned.